Historic lead mining, milling and smelting on the floodplain soils of the upper reaches of the Vils River, Eastern Bavaria, Germany has led to heavy metal contamination within the younger floodplain sediments downstream. 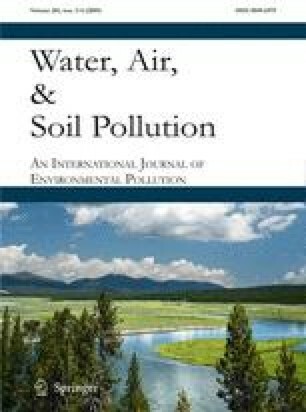 This study aims to date the lead pollution and possible primary sources, display and quantify its spatial distribution within the Vils River floodplain in accordance to soil horizons and characterise the binding forms of lead. One hundred fifty profiles were sampled to detect total contents of heavy metals. Sequential extractions were carried out to determine the binding forms; thus, the potential of lead mobility was characterised. The contamination of the floodplain soils act as an alluvial archive, providing a stratigraphical indicator of mining activities and related sedimentation. The age of the sediments displaying the initial lead peak in the alluvial loams corresponds with sediment accumulations at the onset of the mining period and its first phase of prosperity in the sixteenth century. Enrichments of lead in the oxidic gleysols revealed that dissolved fractions of lead precipitate in the groundwater table fluctuation zone. The sequential extraction proved that lead mobility increases in the psammic and hypersceletic fluvial horizons below the flood loams due to the modest salt contents of the extractants and low pH given in these layers. Thus, the risk of the particulate transport of lead has to be extended to include the danger of potential lead solubility in ground and surface waters. Further, the polluted alluvial sediments also act as a source of contamination, leading to the grave danger of the further pollution of so far uncontaminated areas downstream, especially if the reworking and dredging of the material is allowed to occur. Beckmann, S. (2006). Kolluvien und Auensedimente als Geoarchive im Umfeld der historischen Hammerwerke Leidersdorf und Wolfsbach (Vils/Opf.). Regensburger Beiträge zur Bodenkunde, Landschaftsökologie und Quartärforschung, 12. Retrieved July 4, 2007 from http://www.opus-bayern.de/uni-regensburg/frontdoor.php?source_opus=752&la=de. Hürkamp, K. (2006). Bewertung der potentiellen Gefährdung von Grund- und Oberflächenwässern infolge Mobilisierung von Schwermetallen aus bergbaubedingt kontaminierten Auensedimenten im nördlichen Vilstal/Opf. Regensburger Beiträge zur Bodenkunde, Landschaftsökologie und Quartärforschung, 9. Retrieved September 15, 2006 from http://www.opus-bayern.de/uni-regensburg/frontdoor.php?source_opus=684. Raab, T. (2005). Erfassung und Bewertung von Landschaftswandel in (prä-)historischen Montangebieten am Beispiel Ostbayerns. Regensburger Beiträge zur Bodenkunde, Landschaftsökologie und Quartärforschung, 7. Retrieved September 15, 2006 from http://www.opus-bayern.de/uni-regensburg/volltexte/2005/581/. Richard, N. (2005). Historischer Ausbau oder natürliche Entwicklung? Die fluviale Morphologie der Vils unter dem Einfluss des historischen Bergbaus. Regensburger Beiträge zur Bodenkunde, Landschaftsökologie und Quartärforschung, 6. Retrieved September 15, 2006 from http://www.opus-bayern.de/uni-regensburg/volltexte/2005/564/.